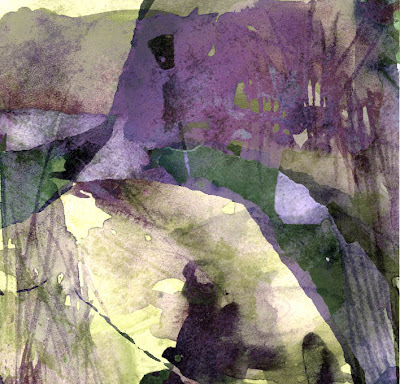 Bridgette Guerzon Mills has featured one of my artists books on her Amano Books blog today. This blog is about her journalling and hand made books. She also has a blog featuring her gorgeous paintings and encaustic works. 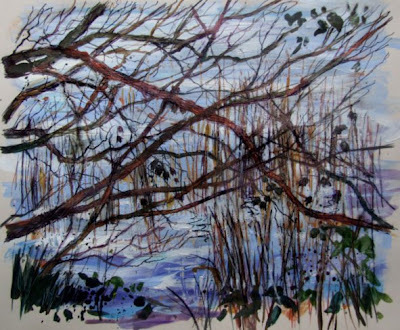 A quick sketch of that filigree of tangled branches and reeds against the water, done in acrylic paint, ink, biro and pencils. It was COLD! Today was beautifully sunny but very cold. Small leaves are coming out on the trees and spring flowers are coming out. I managed to get some photographs of another flooded quarry that I want to sketch. 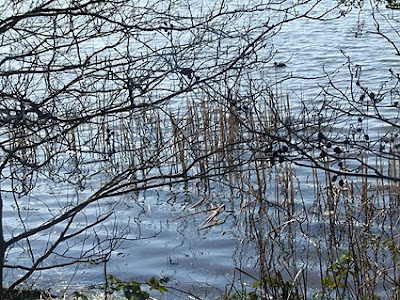 I like the calligraphic lines in this image and may get back there to sketch these reeds before spring foliage makes them thicker. This old quarry has been dammed but across the narrow road is a working quarry, invisible at ground level, hidden behind the trees but cutting deep into the ground. You can see it below. I wonder if they have to pump water out? or because the land is high here maybe it drains ok? This pool is far bigger than the one in the previous sketch, with a small island in the middle. An aerial view and a view across the pool. Still life isn't my usual subject but today was a 'studio day' with a group I belong to. There were models - a woman in the morning and a 10 year old Asian girl in the afternoon or a huge 6 metre still life, set up by members Sue Sansome and Jill Hailes. 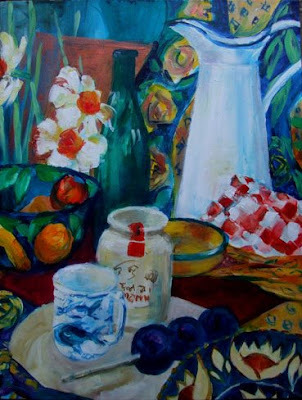 It's years since I painted a still life so I decided that I'd go for that option. They are both known for dynamic still life paintings so I knew they would set up something interesting. The colours and patterns changed along the length with spots and stripes and vividly patterned bowls, fruit, flowers - all sorts! I settled on this section of blues and yellows and touches of red. I lugged along oils and acrylics thinking I would want my oils as well but ended up completing the painting just with acrylic inks and paints. The Charnwood Forest area of Leicestershire is very very ancient rock and the woods in this part are pitted with these old slate quarries - very deep and quite dangerous. I've meant to draw here for a long time and thought it would make a nice change from the canals and river in my waterways project with it's woods and steep hillside - the rocky side is hidden in shadow. I may try to get there at a different time of day when it's lit up. 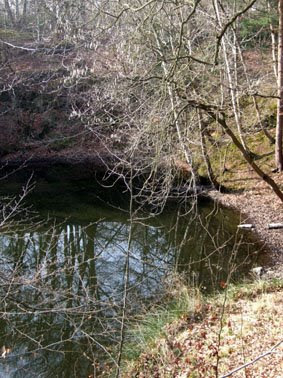 I also plan to visit other flooded quarries, bigger and deeper - though I do like this little one. 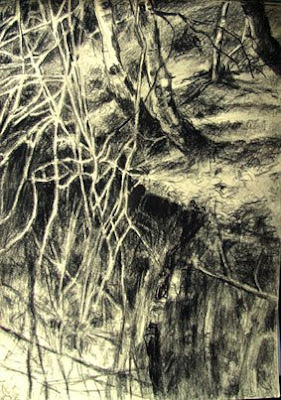 I've mislaid my little battery operated eraser, which would have been perfect to draw those light branches back in through charcoal - so I had to carefully(ish) leave them unshaded. I think this might make it onto canvas as I like the composition - what do you think? I wanted to go and check out how suitable the view of this old slate quarry would be to sketch and park - and it's ideal. I can park right next to it and get an ok view over the old drystone walls, which I can lean my sketchbook on. It's on private land so I don't get much choice on view. I like the reflections of the trees and the way the colour is different - the banks are the dried leaves from last autumn, bleached but with a hint of pinkness against the greens of the ivy. The reflection of the bank though is deep murky greeny colours - interesting. The tangle of trees will be an interesting element to draw. I haven't done quite so much of it just lately but I do enjoy creating images on the computer, they aren't reproductions of anything, they just exist in their own right. These are some I did as part of my degree (done as a mature student). These 2 are further variations - season, weather, time changing the view. These take as long as a painting to produce as they were originally made up of many layers with many techniques and tools used along the way. I made digital images like this very limited editions with small print runs to take away the mass-produced perception of digital art. I believe it can be extremely creative - it's about what you do with it - rubbish in=rubbish out - but put some work into it as you would a painting and I think they can be amazing. 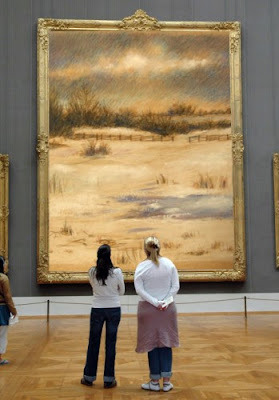 This one is purely an imaginary landscape with heightened colour. I felt like experimenting with the coloured pencils in a sketchbook with buff coloured pages. There are elements of remembered places in Wales and Scotland that feed into the landscape but it isn't anywhere in particular. It was a fiend to photograph and get the colours accurate. This is as close as I can get, it is slightly less purple in reality I think. I do find cp's difficult to scan or photograph with any accuracy on the colour overlays. I've altered saturation and colour balances and brightness and more to try to get it close. I started out with the dynamic lines I intended from a digital image done a long time ago but I knew I wanted the work to evolve in its own way. It's now very different from its starting point. but Joanne showed this fun programme on her blog - take a look - you can put any of your images into a gallery setting. I thought the colours of this one looked quite convincing in an old frame! I sometimes talk about the small group of graduate friends who I meet up with once a month for critiques, art talk and to arrange group exhibitions. I thought I'd show some work by one very talented member, Glen Heath. Some of you will know her work through the sketch book exchanges. 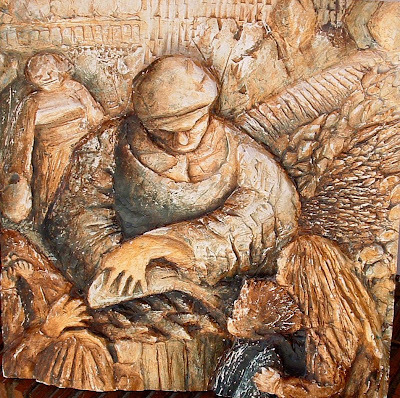 The image above is a relief in plaster, about 2 ft square and full of the bustle and noise of the market. Glen uses these limited colours really well to enhance the sense of space and place. Below are plein air pastels done in a local deer park - the ancient home of Lady Jane Grey, beheaded when her family tried to claim the throne for her. The park was left to the city years ago and is a lovely area to walk, with hills, ancient oak trees, the ruins of her house, rocks, bracken and deer. 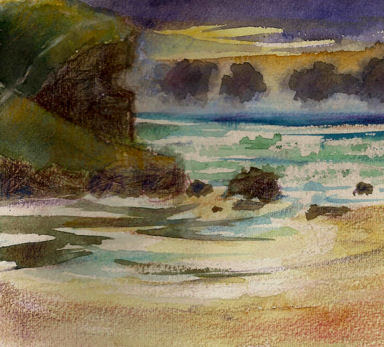 A small mixed media of one of my favourite beaches. ..... UP that 1:3 hill. It was hot, we were tired, it seemed a long way (I was maybe 7). Then my father drove past - slowed down and glared at me - did he give us a lift home and a telling off as we went? no way! He drove on, leaving us to walk the rest of the way knowing I was in big trouble when I got home! An old etching? or pen and ink sketch? 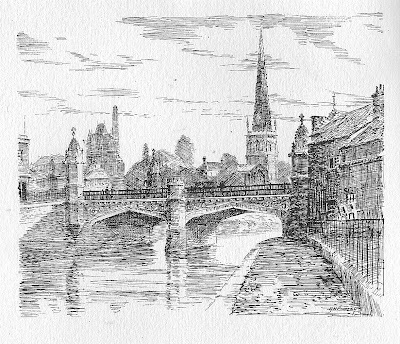 An A H Findlay print of King Richard's Bridge in Leicester near the spot where the body 0f Richard III was allegedly thrown into the river after the battle of Bosworth. Tradition also has it that the monks at Greyfriars, nearby, rescued the body and buried it secretly. Richard was much maligned by Shakespeare (writing for a Tudor king) - he didn't have a hump back and had actually nothing to gain by murdering the princes in the tower as his regentship would end with their deaths. Henry Tudor (the victor) did stand to gain and of course victors write the history don't they? My mother has been having a sort out and found an envelope with quite a few prints of Leicester scenes by A H Findlay. and was going to throw them out - so I rescued them! 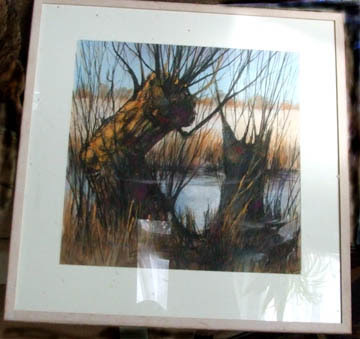 I can't find any information online on the artist. This is my first attempt and it is quite like my writing - though rather neater! You can find it here if you want to have a go. It was very straightforward except for putting it into the fonts folder - their installer didn't have an option to find out where on earth it was saved -so in the end I had to do a search for it and then copy and paste it, which worked just fine. I've been working long hours today so no hew artwork to show - this one is an old digital image, created in the computer. 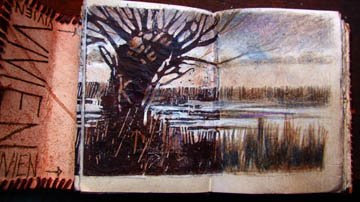 A lino print on left hand page of sketchbook, printed onto tissue paper and then worked on with Polychromos pencils and continued across the double page spread. Trying to catch a cold winter light - the kind that bleaches the colour out of the landscape. This one was printed onto tracing paper and I then worked on the back of it with Polychromos pencils and again, continued the image onto the facing page. 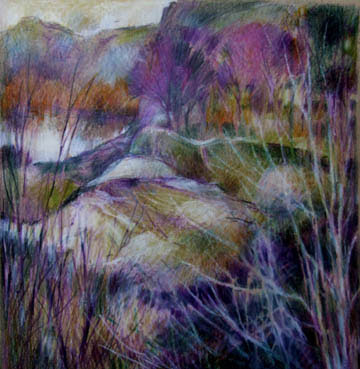 This one makes me think of the mood in Samuel Palmer paintings - does it for you? I think I'll change the mat to a slightly deeper wheat colour to match the field beyond the water. I think it looks better larger - how about you?